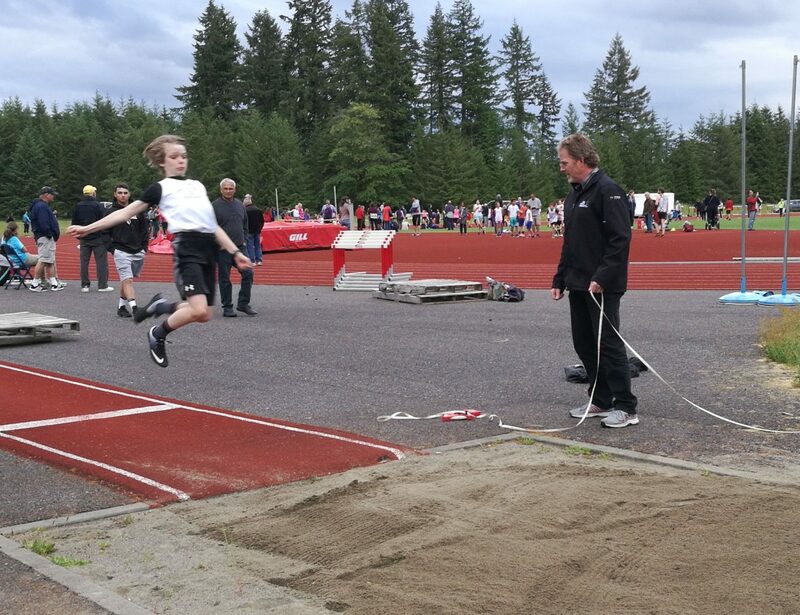 Jonathan Holcombe, 12, of Olympia takes flight in the long jump, setting a new personal record in his first meet of the season. Photo credit: Candice Holcombe. 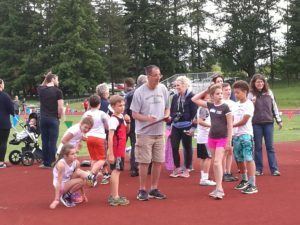 Every Thursday evening in June, the track at Saint Martin’s University will be buzzing with families enjoying the weather and discovering the wide variety of fun the sport of track and field has to offer. Hosted by the local Barron Park Striders Track and Field Club, these weekly “All-Comers Meets” are open to all ages and skills levels. 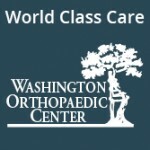 The atmosphere is inclusive and welcoming. Drew Stevick, head coach of the Barron Park Striders, says the emphasis is on trying new things, improving skills, and simply enjoying quality time together as a family. Most of the athletes seem more concerned with beating their personal records than with beating out competitors. 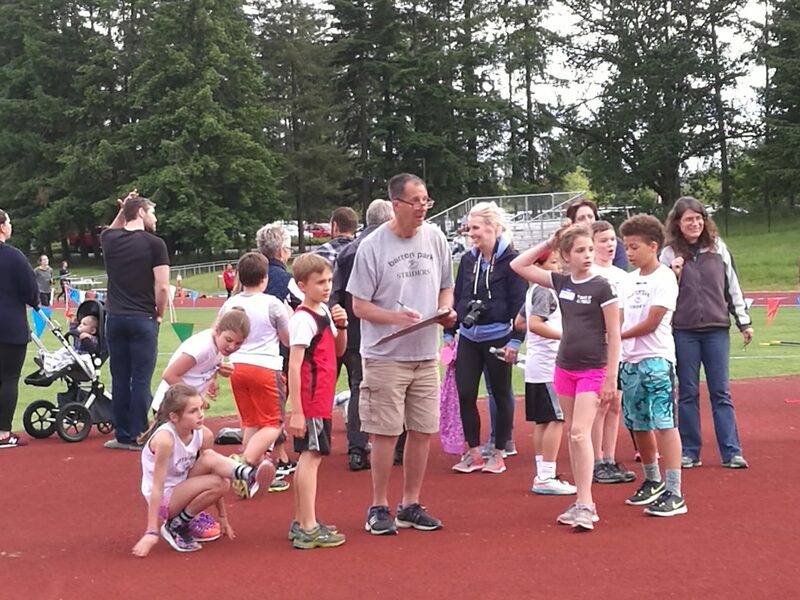 Barron Park Striders Head Coach Drew Stevick (center) guides young athletes through the high jump competition. Photo credit: Candice Holcombe. 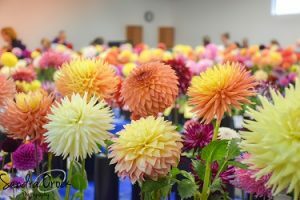 The first meet, held on June 1, presented a remarkable scene. 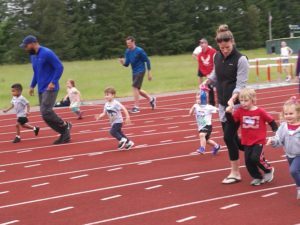 At one end of the field, a group of toddlers ran the 50-meter dash, cajoled and encouraged by their parents along the way. Some scrunched their faces in determination. Others giggled as they bounded along. A few proceeded more cautiously, still covering their ears after being spooked by the starting gun. They recovered their courage a few meters in, and all finished successfully to enthusiastic cheers from spectators. 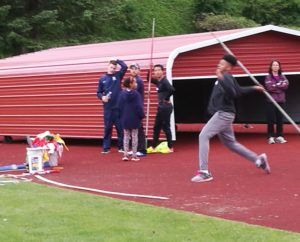 In the middle of the field, older kids hurled the javelin under the guidance of Cassidy Stevick, who coaches at both Saint Martin’s and Olympia High School. Others worked on their high jumps under the direction of Coach Drew. 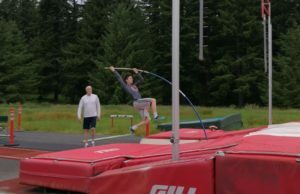 Lutra Felten, 15, of Hoquiam warms up on pole vault as Barron Park Striders coach Dan Cole looks on. Photo credit: Candice Holcombe. 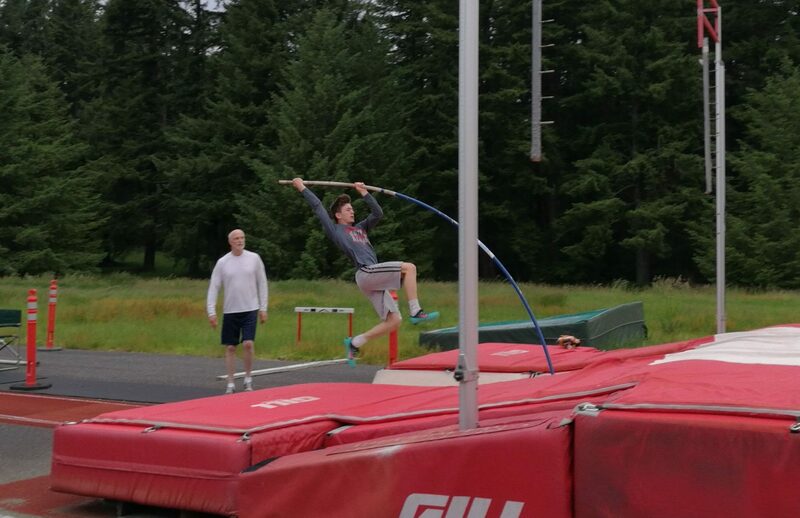 Meanwhile, at the far end of the field, a lean white-haired man in his 70s practiced the pole vault (yes, the pole vault) along with a handful of high school athletes. Dan Cole is just one of a number of local athletes aged 50 and over who compete nationally in the Masters Division and also participate in the All-Comers Meets. Coach Stevick estimates that about 20 athletes in the 18-to-50 age range also came to the meet. When they say the meets are for all ages, they truly mean all ages. It’s a rare sporting event that can bring the whole family together to practice and compete alongside each other. The beauty of track and field is how easy it is to participate – all it takes is a basic ability to run, jump, or throw. 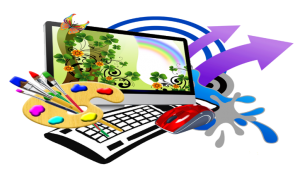 With such a wide range of events to choose from, there is an activity to fit just about anyone’s strengths and abilities. A fun option for families wanting to compete together as a team are the relay races, which are not separated by age or gender. Parents encourage the youngest runners in the “4 and Under” age bracket of the 50-meter dash. Photo credit: Candice Holcombe. This year, the All-Comers Meets have moved from Tumwater to Saint Martin’s University in Lacey. Organizers were concerned the venue change might lower attendance, but the June 1 meet was one of the largest yet, with close to 200 participants. Just under half of those are members of the Barron Park Striders, with the rest coming from across Thurston County and beyond. 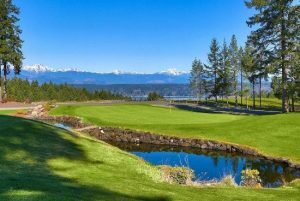 Groups of athletes come from as far away as Adna, Shelton, and even coastal Hoquiam. The meets have never been heavily publicized, so the continued growth comes mainly through word of mouth. 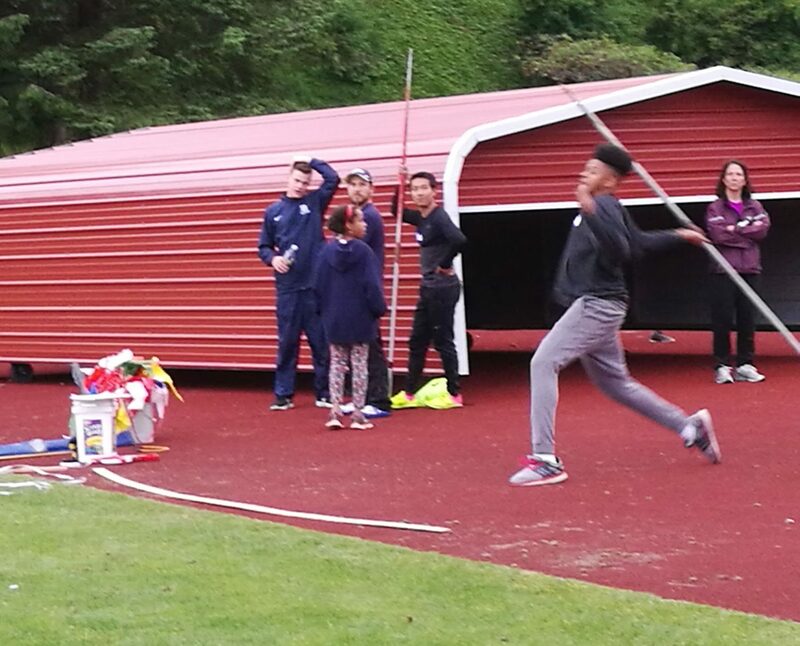 Imani Mabwa-Childress, 17, of Olympia attempts to beat his personal best in javelin. Photo credit: Candice Holcombe. The Saint Martin’s track is accessed from Pacific Avenue. Parking is free. Check in at the registration table upon arrival. Registration is $5 for one athlete or $10 for the entire family. Entrance is free for family and friends who are just there to watch and cheer. Each athlete may compete in up to four events. The meet offers 12 running events and nine field events to choose from. Most field events run on an open schedule, but races require runners to gather near the starting line at a specific time. Participants receive a meet schedule at check-in, and races are also announced over the loudspeaker so runners know to line up. All events are officially timed and measured by U.S. Track and Field standards. More information on the Barron Park Striders can be found on their website.